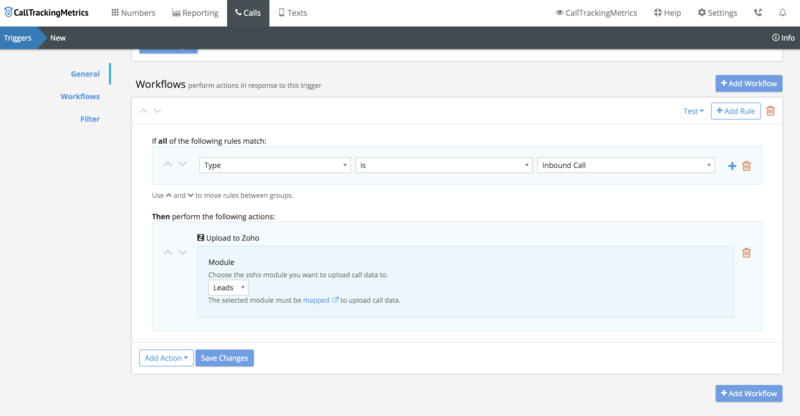 CallTrackingMetrics can integrate directly with your Zoho CRM account so that calls coming through your tracking phone numbers appear automatically as leads, activities, or as a custom object in Zoho CRM. This is a powerful way to ensure that all of your advertising and agent performance data feeds right into your Org so that your team can see which campaigns are driving calls and resulting in sales, giving you full visibility and actionable data to maximize your ROI. Insert and update Zoho CRM records as calls are received using triggers to send call data directly to Zoho CRM. You must have a Zoho CRM account. You can customize what data you send to Zoho CRM, and when. By using triggers, this process can be completely automated. It’s also possible to customize the data that is sent by mapping CTM fields to the corresponding Zoho CRM field. These mappings can be unique across all Zoho CRM modules you have created. Navigate to Settings → Integrations → Zoho CRM. Connect your Zoho CRM account by clicking “Connect to Zoho”, then signing in to Zoho CRM and allowing CTM access. Once your account is linked, the page will refresh with a list of the Zoho CRM modules configured in your Zoho CRM account, and the ability to map CTM call data fields to their corresponding fields in Zoho CRM. If you’d like to automatically have call data sent to Zoho CRM create (or update) a trigger to include a “Upload to Zoho” action. Select which module you’d like to push the data to. Note: Only mapped modules will be available to push data to. If you’d like to manually insert/update Zoho CRM records open the Zoho panel in the call log and enter the appropriate data then click “Insert Zoho Record” or “Update Zoho Record.” The module you’ll be pushing the data to doesn’t need to be mapped on the integration settings page in order to do manual record management.